Daily Illuminator: Our Merry Munchkin Haul-iday Vault Is Open! September 20, 2017: Our Merry Munchkin Haul-iday Vault Is Open! To help you make all the merry Munchkin mayhem you and your loved ones can during this wonderful time of the year, we've pulled our favorite holiday-themed Munchkin goodies out of the vault for you to obsess over! Satisfy the Munchkin fans in your life with Munchkin Yule Log, a holiday-themed gameboard complete with Christmas decorations for every level, tokens in six colors, and matching colored markers! Keep your entire Munchkin haul together, like the 12 Days of Munchkin Christmas Coloring Book and your new Munchkin Jolly Jumbo D6, with the Munchkin Christmas Monster Box, which will store all your cool Munchkin loot in one place, with a themed cover illustration by Ian McGinty. Munchkin Christmas Lite is the perfect introduction for new players, and a great holiday-themed set to mix with any Munchkin game. And of course, there's Munchkin Holiday Surprise for a stocking-full of stuff to expand your game! You can also keep your games organized during the holidays with merrily themed playmats, like the Munchkin Pathfinder Playmat: Presents Unaccounted For and Munchkin Playmat: Spyke's Christmas Wish. Both not only keep your play area neat, they give you special gifts once per game to help you get ahead of your friends! And for you secret Santas out there, you can use the Munchkin Journal Pack 3 to keep your lists. Just make sure you check them twice. If you're looking for even more Christmas-y delights, our Munchkin Holiday Grab Box Kickstarter just launched - and funded in under 15 minutes! 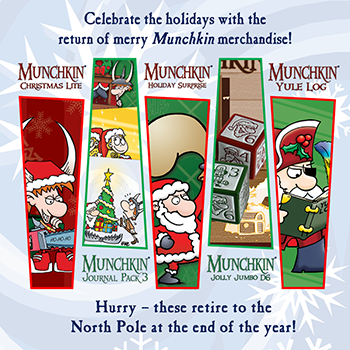 Get an assortment of goodies, perfect for expanding your Munchkin collection or giving as a gift. Plus, it's scheduled to deliver before Christmas, so you can stuff all the stockings! Now that you know more about our holiday treasures, get your valuables together and give them to us - ahem! We meant you should use them to get some of this loot for yourself! You can find these holiday favorites at your local game store or through Warehouse 23.